In the wake of the Trump administration's latest attempt to overturn the Affordable Care Act, Axios' Mike Allen sat down with a series of policy makers to dissect the state and future of health care in America. Why it matters: We heard from leaders on both sides of the aisle as well as Ohio Attorney General Dave Yost (R), who earlier this week broke with his party when he urged the 5th Circuit Court of Appeals not to throw out the entire Affordable Care Act. 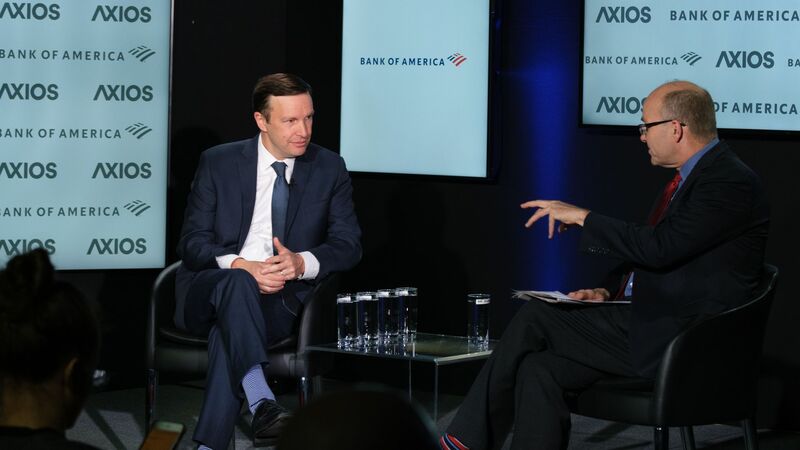 Sen. Murphy discussed both his short-term and long-term vision for health care. In the short-term: Save the Affordable Care Act. "The minute the decision is made [to overturn the ACA], the entire act becomes unconstitutional ... You're talking about 15-20 million people losing health care overnight. That is a humanitarian catastrophe." In the long-term: Enact Universal Medicare buy-in, rather than Medicare for All. "Every single person should be able to purchase a Medicare plan ... Medicare buy-in is a big enough idea to capture people’s imaginations but politically palatable enough to actually pass." Rep. Meadows, who chairs the conservative House Freedom Caucus, gave his take on where compromise is possible and admitted he doesn't think the ACA will be struck down this time around. What can be done: "Prescription drug prices might be the sweet spot where you see Republicans and Democrats coming together. I’m optimistic ... my goal is that by next year we see a 20% reduction in prescription drug prices." What can't be done: "I'm not as optimistic that the courts will strike [the Affordable Care Act] down," but added: "I don’t think it’s here to stay." AG Yost, who broke with Republicans when he asked a federal court not to strike down the entire Affordable Care Act, explained his reasoning while emphasizing that he still wants to get rid of the law's individual mandate. "If a patient has a tumor, you don’t kill the patient. You cut the tumor out. That’s what we think we should do here," AG Yost said, clarifying what he thinks should been done to the ACA's individual mandate. "The reason we're in this lawsuit is because it will impact Ohioans — the people I serve." Axios' Caitlin Owens and Mike Allen discuss why it matters. Owens closed out the program, sitting down with Mike to provide her analysis on why these conversations mattered. Her take: "The undercurrent I kept hearing today is the growing awareness of health care cost ... this is an unconventional thing for Republicans to be saying."